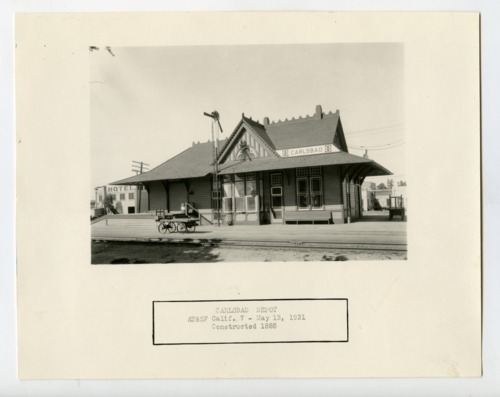 This sepia colored photograph shows the Atchison, Topeka and Santa Fe Railway Company depot in Carlsbad, California. This gabled Victorian structure was built between 1887 and 1888. The depot provided passenger service until the 1960s. In 1995, the building was placed on the National Register of Historic Places. Presently, it serves as the town's Convention and Visitors Bureau.